As a conservative, I believe that people occasionally need help to access the American dream, but I don’t believe that the American dream should include two or three generations of collecting benefits from the government. We handled poverty much better when it was a local issue done by local charitable organizations. In creating “The War on Poverty,” we have created a huge bureaucracy that has no incentive to actually decrease poverty. 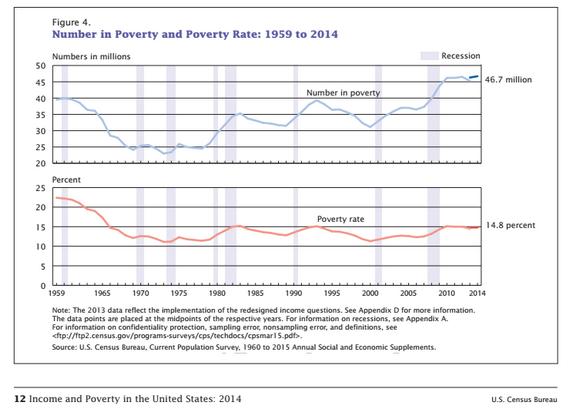 As you can see from the above chart, we have not made significant progress in ending poverty. Instead, we have created a vehicle for those who choose not to develop the discipline of going to work every day to live quite comfortably while the rest of us earn the money to support them. This is not a workable long-term arrangement. Meanwhile, the Mayor of Albuquerque has a much better idea. On Thursday, The Washington Post told his story. Tillerson (Kellie Tillerson, director of Employment Services at St. Martin’s Hospitality Center, the organization that facilitates the city’s program) said a lot of the people who get picked up by the van were not aware of all the services available to them. One man who recently got out of prison returned to St. Martin’s the day after taking one of the city’s jobs. She said it enrolled him in the day-labor program, told him about behavioral health services and are helping him get an ID. …The program hasn’t weeded out all panhandling in the city, and supporters say that’s not really the point. It’s connecting people who would otherwise not seek help to needed services. And it’s showing them when they are at their lowest that they have real value, and that others are willing to show them kindness to help them have a better life. This program makes a lot of sense. Charity begins at home. I wonder sometimes how the Internal Revenue Service feels about that, but that is the conventional wisdom. Exhibiting their usual talent for taking things to the legal limit, the Clinton family obvious believes that charity should begin at home. The Washington Free Beacon posted a story today about Hillary Clinton’s tax returns for 2014. The Clintons earned more than $28 million in 2014 and claimed around $3 million in income as charitable tax deductions, according to tax returns released by Hillary Clinton’s campaign last Friday. The campaign emphasized Clinton’s charitable giving in a press statement, saying that it “represented 10.8 percent” of her income in 2014. But roughly half of that money—$1.8 million—appears to have been channeled to the Bill, Hillary, and Chelsea Clinton Foundation. According to the tax returns, the Clintons gave $3 million in 2014 to the Clinton Family Foundation, a small private foundation that the family uses as a pass-through to other charities. Records show the CFF disbursed $3.7 million in 2014, including $1.8 million to the Bill, Hillary, and Chelsea Clinton Foundation. Just for kicks, let’s look at how the Foundation spends its money. The Bill, Hillary, and Chelsea Clinton Foundation evidently funds a good deal of the travel expenses the Clintons generate. It must be nice to have a Foundation that helps with the expenses of your Presidential campaign. Americans for Tax Reform slammed Clinton on Tuesday for forming an “Article 4 trust,” which the group said appears to be a method to avoid paying estate taxes—a tax Clinton has supported. Another example of taxes for thee, but not for me. Would You Give To Any Charity That Gave So Little To The People It Was Claiming To Help? The Clinton Foundation has been in the news a lot lately. There are some real questions as to what some of the donations actually bought or why they were given. Now there are some real questions as to how wisely the money was spent. Unfortunately this problem is not unique to the Clinton Foundation. It is a good idea to do some research before you give to any organization in order to find out how much of your gift will actually be spent on the mission of the organization. Charity Navigator rates charities according to their financial transparency and overhead. For example, Goodwill Industries of Greater New York and Northern New Jersey is rated at 89.62, the American Red Cross is rated at 85.25, and Operation Blessing is rated at 92.12. The Charity Navigator has placed the Clinton Foundation on a watch list. That says it all.